*This is the distance made on the official route, but due to having to take some road walking detours, we really hiked 23mi/37km. The wind died down overnight. We did wake to quite a bit of condensation in the grass, but not as bad as it could’ve been. We headed out just before 7am for our big 25mi/41km day. We would have liked to do less, but we need to land in the right place to do a low tide crossing tomorrow morning. If we hadn’t pushed these last few days to line this up, we would have had to wait another 24hrs to do it the next day. We decided it was worth doing a few bigger days than adding another day, and possibly paying much more in lodging with how the shorter days would have shifted us. The morning started off a bit rough as we had two wrong turns that were quickly noticed after about 100m, but not until after we had already climbed a hill each time and had to go back down. Morning light and farmland walking. I had naïvely made the comment that we might actually get a day with dry shoes today, but within 10 minutes of our day this morning, we had a good hour of cross country across farmland that had very tall wet grass. The dry shoes didn’t last long at all. 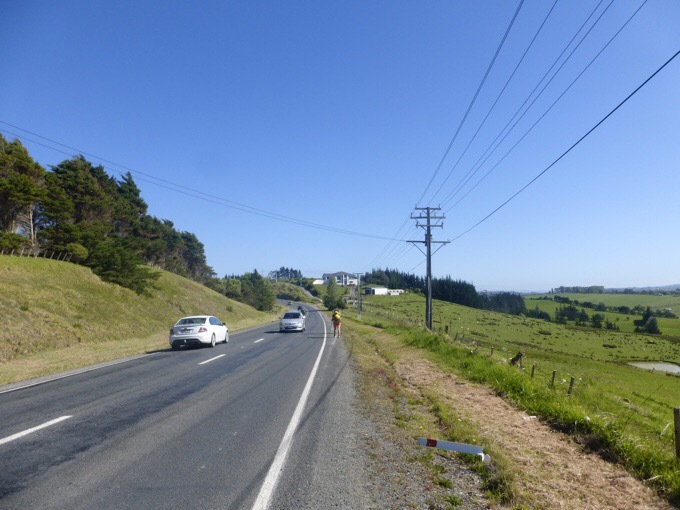 After going through the farmland, we came to outskirts of the town of Puhoi. There is a walking track that parallels the road up on the ridge and it is my favorite section so far. Maybe it is because we’ve been in such terrible forest tracks that this one felt incredible in contrast. Whatever the town of Puhoi did to fund such a track, I applaud them. It was 5 km of beautiful trail! 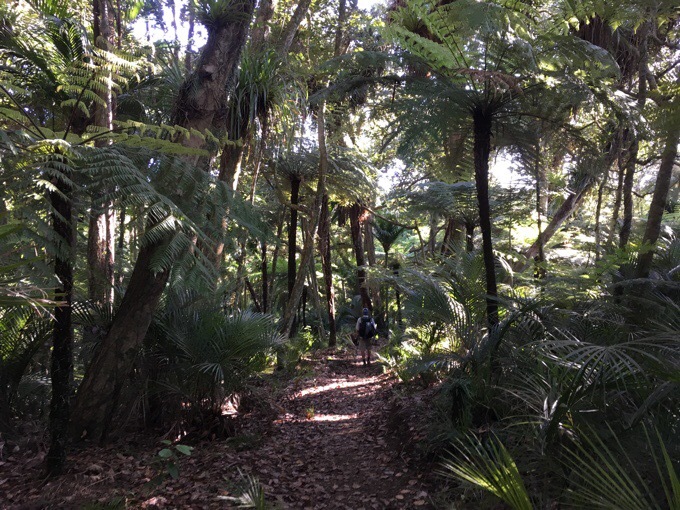 I even commented that maybe it will be my new life mission to move to Puhoi and maintain all of the forest tracks we’ve had north of here to make them just as good as this one. I love forests and being out here has sadly made me dread the forest sections. Today, for those 5km, I got to relax and wind through a forest that I could take in and feel at home in. 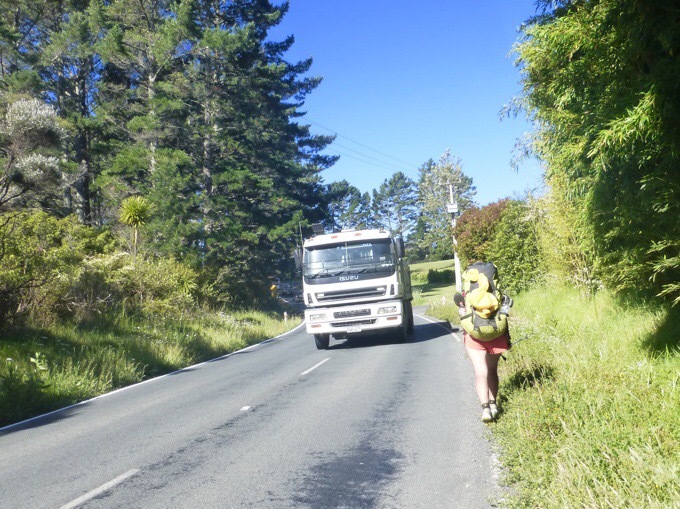 After that, the rest of the day was on highway or sidewalk winding through five towns just north of Auckland. The traffic increased as the day went on and we got closer to the big city. 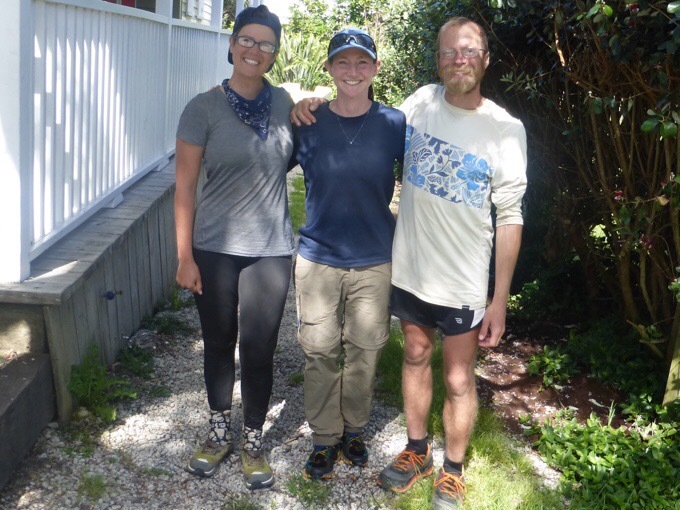 Just as we were walking into Puhoi, I heard someone say my name, and I turned to see Softwalker/Matt and his sister Laurel. Although Softwalker and I have spent maybe two hours of our lives together, at the most, we have a very sentimental bond. Softwalker and I shared a van with many other people on the very first day of both of our very first thru-hikes when heading to the southern terminus of the Pacific Crest Trail in 2011. While in the van to drive the border, we discovered that we both are raised in Southern/Central Illinois, which is very random. We both have gone on to hike well over 10,000mi and countless trails around the world. We took a photo together at the start trail in a group and I never saw him again, though we were in touch through Facebook. I didn’t see Softwalker again until two years later in 2013, when we were both doing the Continental Divide Trail. We crossed paths as he was coming in from town and I was heading out. 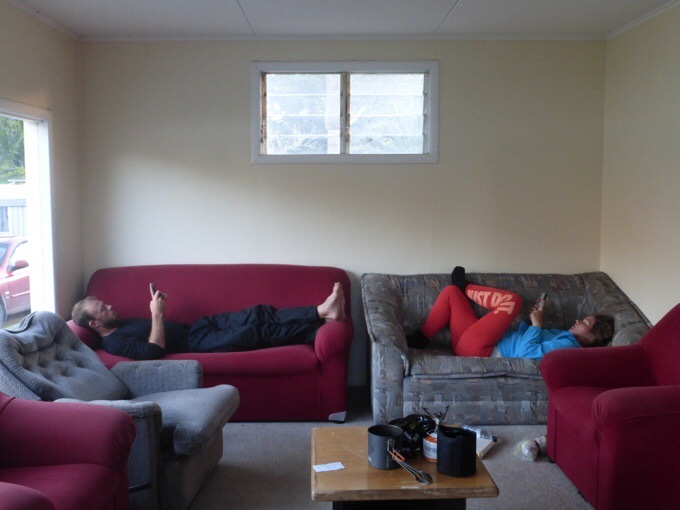 Now this year, he is on the TA with his sister Laurel and we got a bit more time to talk while in Puhoi taking a break. 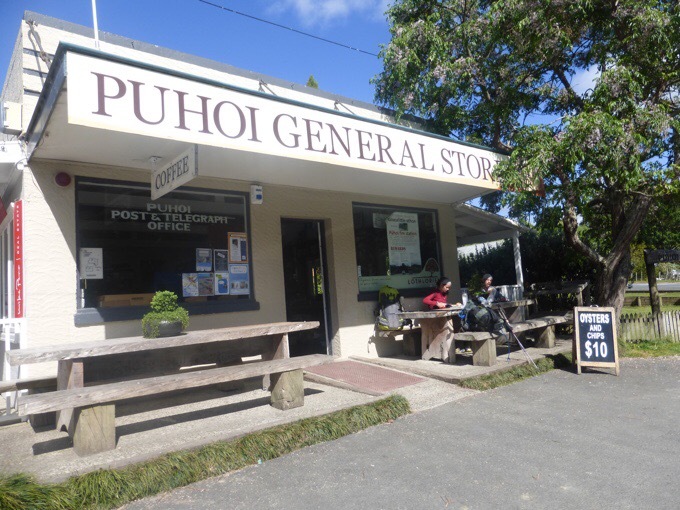 Puhoi also has the oldest pub in NZ, but it was morning and not open. Softwalker and Laurel were waiting for a half-day to do a kayak down a river section of the trail for 8km. They had to wait for the water levels to be right, so it wouldn’t be until afternoon when they would do that and it is $50 a person. 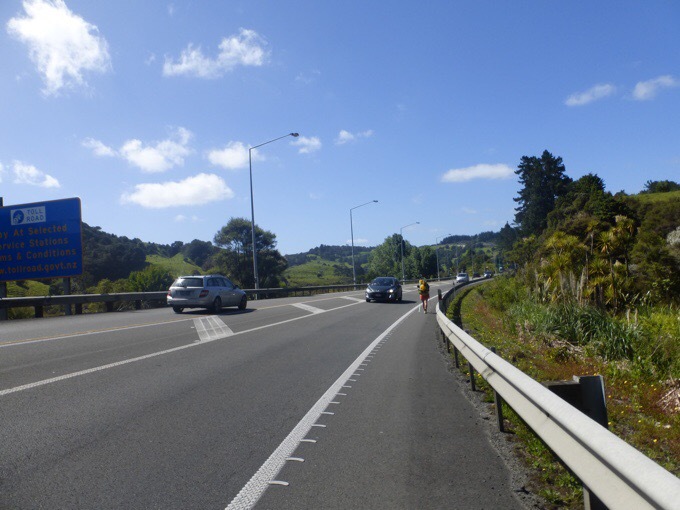 We knew that was an option, but chose the 5km highway walk instead. 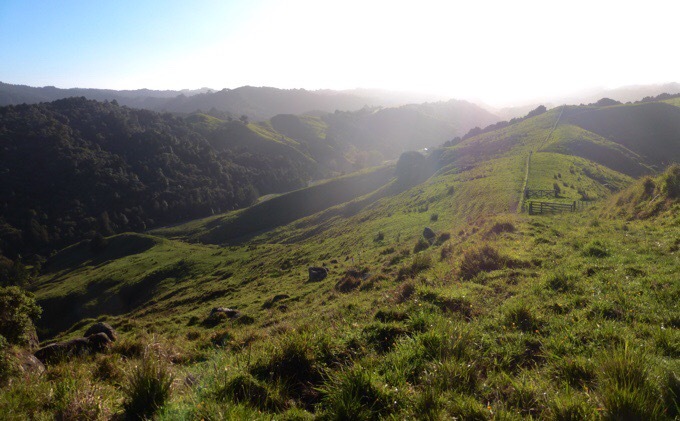 We might all hike out of Auckland the same day on Thanksgiving, which would be fun. 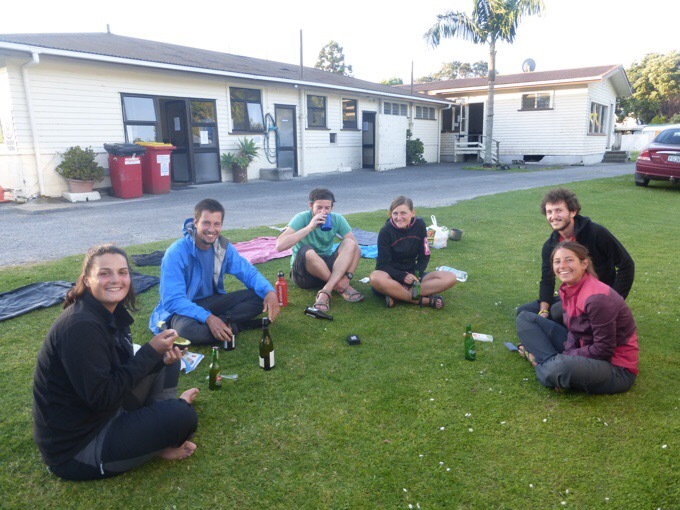 After the 5km major highway walk, we stopped at the minimart in Waiwera and had a brief break again. In addition to the highway walk around the river, we also hit the high tide with the following beach walk. The tides have been exceptionally high ever since the super moon, and there was not a way to do the beach walk unless we waited many hours. 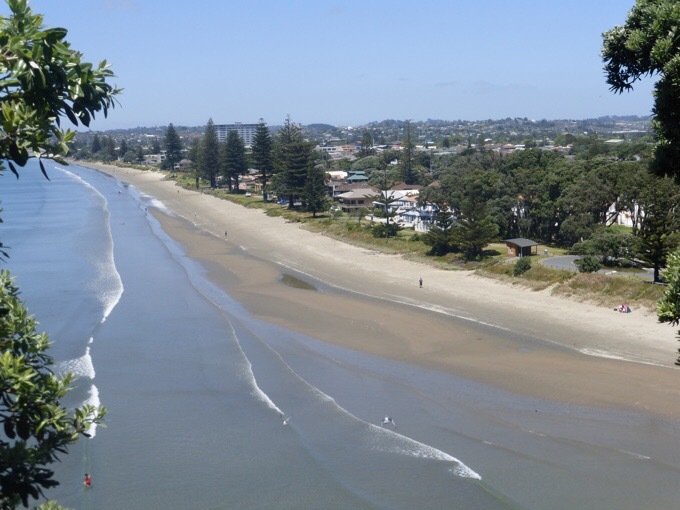 The highway walk was fast, and we reached the town of Orewa for lunch. We could see the whole city as we were walking in, and it was quite large. We did not expect that and Will quickly spotted a McDonald’s sign. A lot of today looked like this. 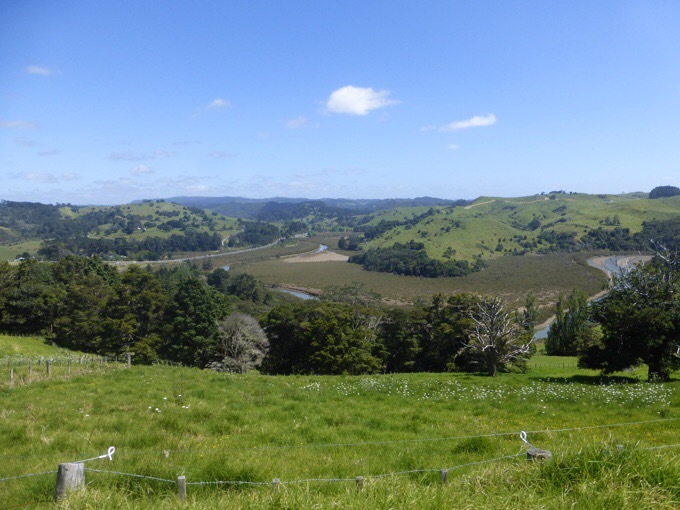 Looking down on the Puhoi River we decided not to kayak. The excitement went through the roof. 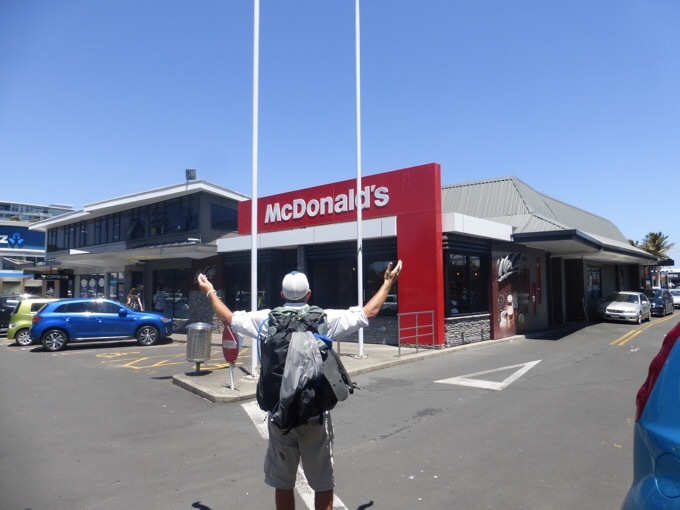 Will loves his American fast food, and has it almost nightly back home, but has missed it greatly out here. The best thing about McDonald’s is it has free and fast Wi-Fi. We were excited to have lunch there. Quite the moment for Will. We still had 10mi/17km to go to get to our destination, so we were not able to stay as long as we would have liked, but we got a good hour and a half there. I had the best milkshake I’ve had all trip. I swear out here, a milkshake is more like milk with a faint hint of chocolate. The one I got today was thick and actually tasted like chocolate so I was in heaven! It is just sad that I have to go to McDonald’s to find it because I actually don’t go to McDonald’s back home. 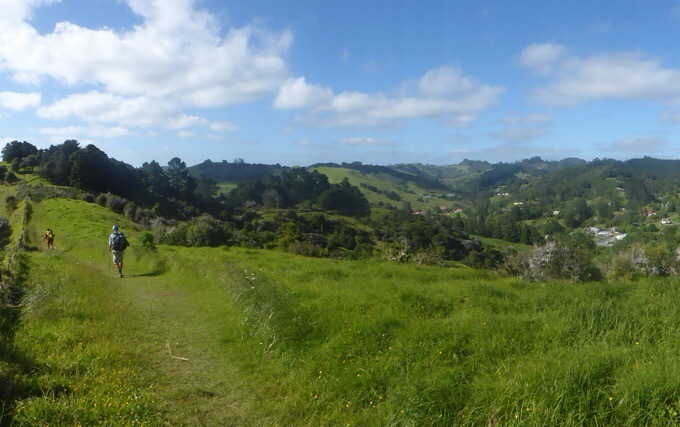 We walked out of town, and 5km later, reached the town of Silverdale where we all needed to pick up an item or two from the grocery store for our last day into Auckland tomorrow. As we walked through town, it was afternoon and the evening traffic was picking up. The traffic went right through the area where all the Silverdale schools are. We walked through just as school was being dismissed in a sea of middle schoolers. It felt really awkward to be walking around in a pack around a bunch of middle schoolers when I’m used to that situation as a teacher. 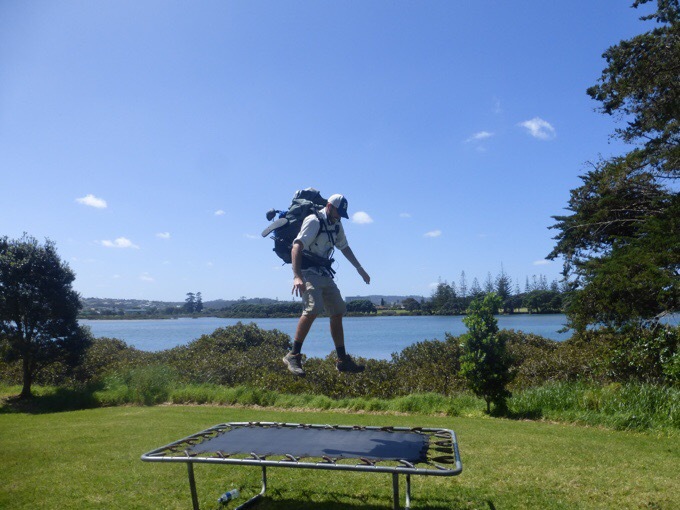 A trampoline along the way. 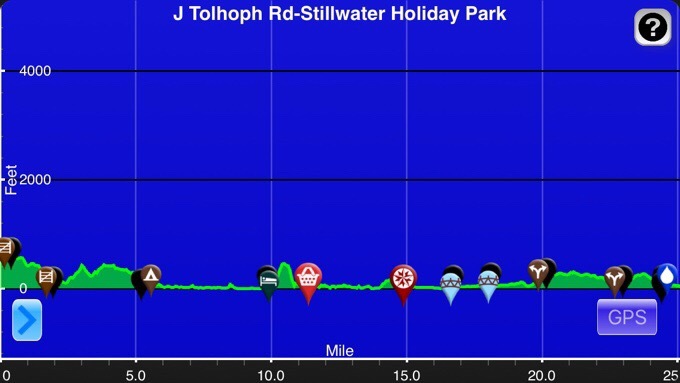 The final push was to the holiday park (a caravan park) in Stillwater. It started with a great walkway along a bay and then ended on busy highways with little to no shoulder for well over an hour. It was not very safe. Not much room for walkers and lots of evening traffic. 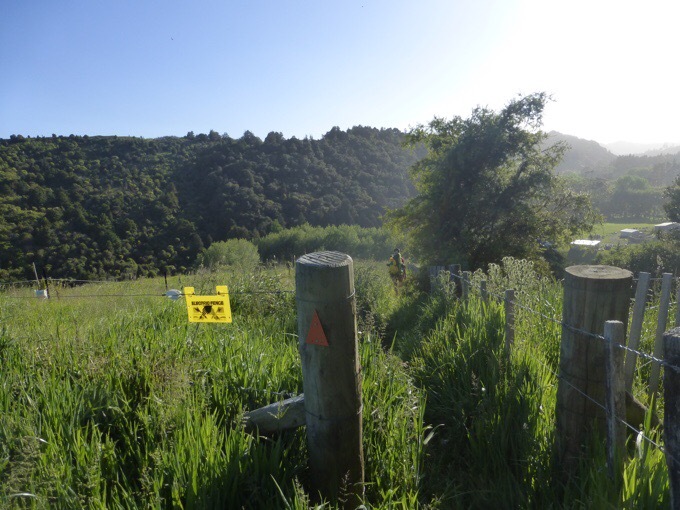 We had worried that it would be at least $30 a tent because we had heard it was expensive as we got closer to Auckland, and I hadn’t been able to reach anyone to find out what price it was. I finally got through to someone as we were walking and found out that it is free! AMAZING! We arrived just after 6pm and the manager is super great to TA walkers. He has a pool hall with bunk beds and a carpeted tv room we can all sleep in if we don’t want to pitch tents, gave us a voucher for 500MB of wifi, and a coin for a 5min hot shower, so amazingly great! He knows we have to stay here to line up for this crossing and we all tend to get bottlenecked here. We are here with three couples that have been hiking together. Jasmin & Joel (Switzerland), Alex & Claudia (Germany), Greg & Annabelle (France). Well that’s the end of this odd day. It felt really weird to have a day full of towns like that. 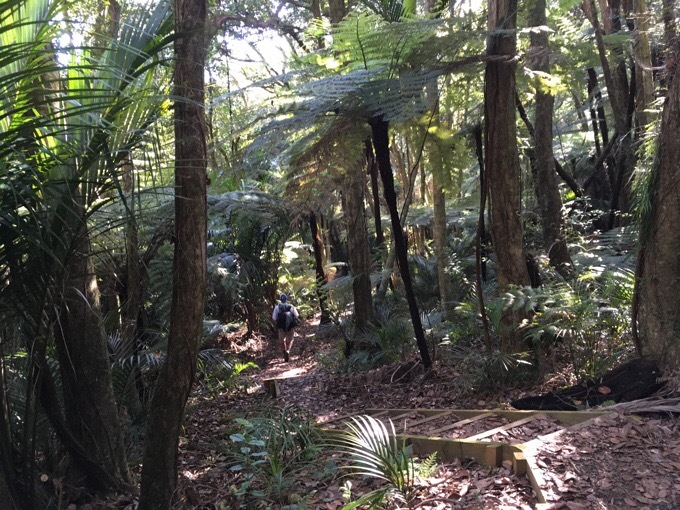 I’ve heard that things get much better a bit after Auckland as far as possibly real trail and camping opportunities. I’m looking forward to something more like the thru-hiking I identify with. We all agreed that we aren’t feeling like hikers as much as drifters with all these towns and little wilderness. Hang in there, it should hopefully improve soon. I got a late night message from Softwalker and Laurel. They hadn’t planned to make it this far, but are stuck in towns with nowhere to stay, so they had a late night KFC stop and are going to try to go til midnight to line up the crossing in the morning, so we may get to hike together some. Just another “campsite” on the TA. I hesitate to ask this as I’d hate to jinks you but…..you haven’t lost anything so far. May be that’s all behind you now. Let’s hope so. I’m very much enjoying your hike so far, lots of info for future hikes. Thanks so much for taking the time to record everything, good on ya! Haha, you may have missed my mention of losing my sunglasses on Day 12 because that was a lengthy post focused on other things. That one stung and I got new ones a couple days later, but they are not as good and I’m reminded every time I wear them how much I miss my other ones!…I also lost a pee rag the first week, but didn’t mention it:) Yep, still losing stuff, but less often hopefully! Such an absolutely intriguing hike you are on. Doubt you will ever find another quite like it but how special that you get to experience it once. Good luck for better terrain coming up. I hope the crossing goes well for you guys. We got to it right at low tide and it still felt too unsafe, so we took the forest track alternative around (adding many, many miles). It ended up being our longest day because we got to Longs Bay Regional Park, which was mistakenly listed as a place to camp in our trail notes (they have since updated it–you cannot camp there). 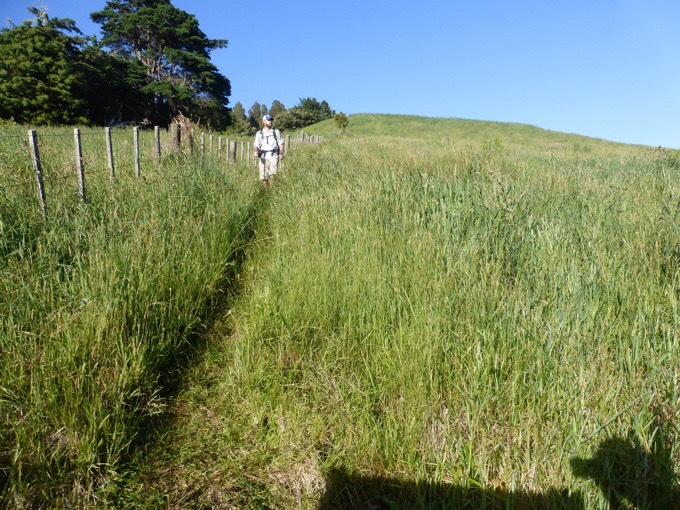 We pushed it all the way to the very expensive Takapurna Holiday Park very close to the ferry terminal in Davenport. I am curious what you all are going to do for camping in this section; I heard they may be closing that holiday park. If you haven’t booked yourselves a place in Auckland yet, try Brown Kiwi. It’s a mile from the center of the city, but it is so much quieter than those other hostels. You’ll see it went quite well and I can see how it can be sketchy if you don’t do it exactly as explained in the notes. Maybe they’ve gotten more detailed now. 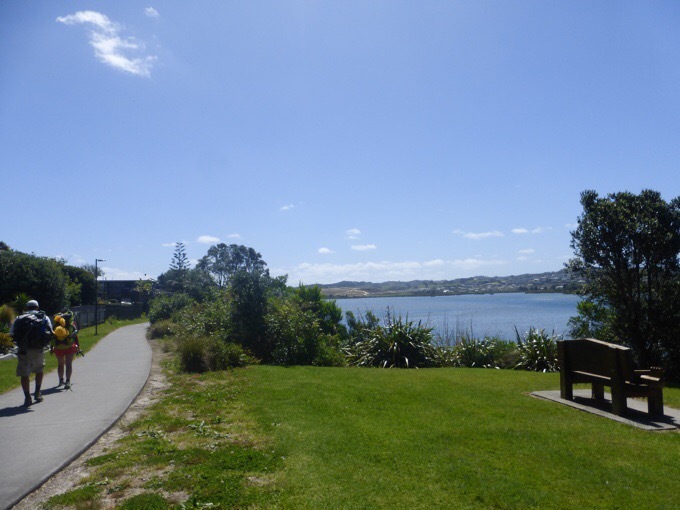 Luckily, we all have contacts in Auckland to stay with and there seems to be some freedom camping just north of the city we can make it to on our first day out. Hopefully, we’ll dodge the pricey stuff I’ve heard about! Wired with the amount of energy you use each day, the junk food stops don’t matter. I’m interested to know, do you find once you stop the 40km a day walk routine, the weight wants to reclaim its space unless you watch what you are eating? Oh yes, the weight comes back on immediately, though I don’t think I’m losing anything on this hike at all yet. Good thing for me is that as soon as I stop hiking, my stomach doesn’t want as much food, so it does a good job of naturally balancing and I don’t have to fight hiker hunger after the hike. Sometimes you gotta work really hard to get the 5K of quality forest walking, but congrats! Thanks for featuring Softwalker. I really like the personal bits. I think those are what make the community so cool. Glad the low-tide crossing went well.